On Saturday, September 29, 2018 thousands of volunteers will come together to care for Oregon at over 100 hands-on projects, and we want you to be there! 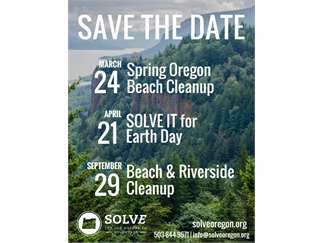 SOLVE’s Beach & Riverside Cleanup, presented by the Oregon Lottery has been a family-friendly tradition for over thirty years! Our projects are a great way to explore the outdoors, meet your neighbors and make a difference. Across the state, Oregon’s coast and natural areas continue to face threats from diminishing wildlife habitat, invasive plants, and litter, which flows downstream to rivers and out to the ocean. By volunteering, you’re stopping litter from making journey through our state and out to the coast, ensuring clean and healthy water ways for all. Projects will focus on cleaning up and restoring natural areas and neighborhoods with hands-on work. Supplies and instructions are provided and all ages and abilities are encouraged to join in! To register and view a list of project sites, visit solveoregon.org or call 503-844-9571 ext. 332 or 1-800-333-7658. Registration will open in July of 2018. Want to lead a project? Contact SOLVE at 503-844-9571 ext. 332 or via email at info@solveoregon.org.